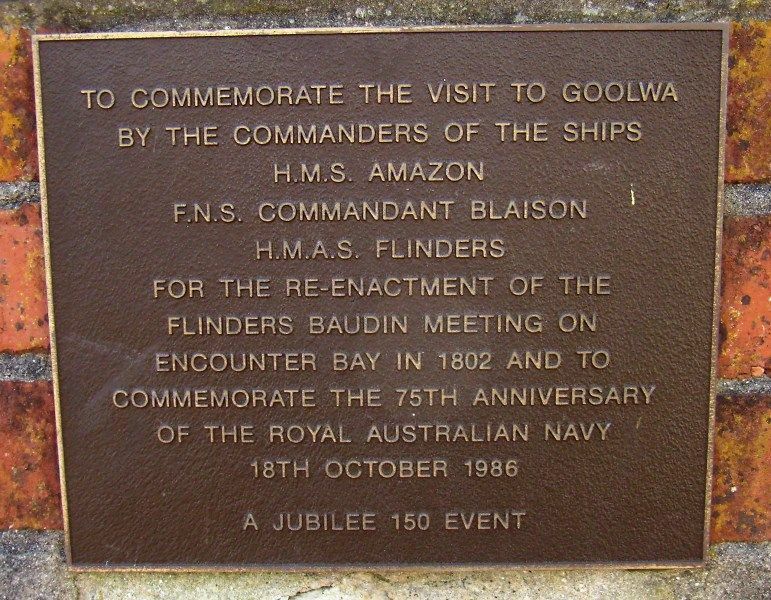 A plaque commemorates the visit to Goolwa of the Commanders of the ships H.M.S Amazon, F.N.S. Commandant Blaison, and H. M A.S Flinders for the reenactment of the Flinders Baudin meeting on Encounter Bay in 1802 as part of a Jubilee 150 event. The plaque also commemorates the 75th Anniversary of the Royal Australian Navy. South Australia celebrated the sesquicentenary (150th anniversary) of European settlement in 1986. And to commemorate the 75th anniversary of the Royal Australian Navy.